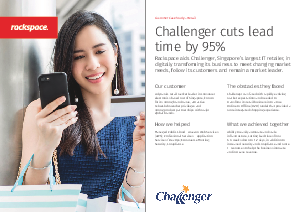 Since setting up in 1982, Challenger has grown to become Singapore’s largest IT retailer. To meet the demands of rapidly evolving market expectations, it decided to transform its business on a true Online to Offline (O2O) model, to enable an integrated shopping experience. For its migration to AWS, Challenger partnered with Rackspace at the suggestion of Gartner, to gain immediate access to its AWS expertise and strong managed services portfolio. With Rackspace architect and operational teams providing valuable insights and technical advice, the entire business model migrated to a secure and compliant cloud environment, which allowed Challenger to meet new store demands with lead times of 1-2 days, rather than 6-8 weeks. The infrastructure is also easy to automate and scale, to free internal IT to focus on business innovation and revenue growth.